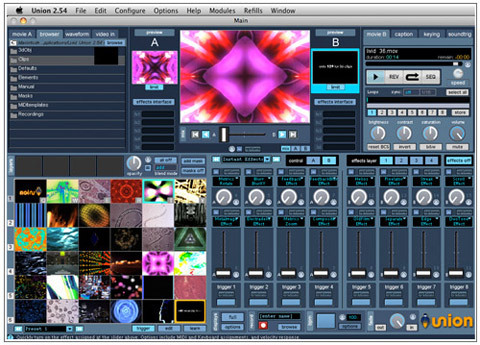 Union transforms your computer into an all-in-one live VJ software mixing studio with hundreds of effects, live video inputs, audio aware effects, and complete MIDI integration just to name a few features. Union give you the tools you need to create, mix, control, perform, and record cutting edge visuals in real-time. Forget about expensive hardware rigs and confusing equipment - let Union expand the possibilities of your creativity. Union is built around the idea that video creation should be spontaneous and easily created in real-time. Livid's video engine allows for instant manipulation and control of multimedia content. Utilizing hundreds of built in effects and support for FreeFrame effects, movie triggering, live feed manipulation, advanced modules, MIDI learn and countless other performance enhancing tools, Union turns your computer into a complete VJ mixing studio. Union reshapes the process of creating video content and saves you valuable time by allowing all effects processing and content placement to be done on the fly. Replacing the traditional time-consuming timeline and keyframe approach, which can take hours (if not days) to render, Union's effects and clip placement can be done in real-time and saved to disk. This approach opens the process of video production to a whole new world of experimentation and creativity. The intuitive and flexible interface provides a platform for ideas to come to life.